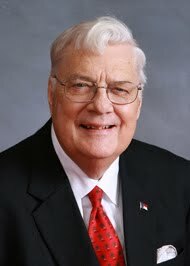 Sen. James Forrester, who represents Gaston, Iredell, and Lincoln counties in the NC General Assembly and who was a prime sponsor of the anti-gay marriage amendment proposed for the NC Constitution and who is (supposedly) some kind of medical doctor, falsified his credentials on his own campaign website and on the Gaston County Republican Party website ... claiming that he is a "Fellow of the American College of Preventative Medicine" (ACPM). Not only is Forrester not a Fellow of the ACPM, the highest level of distinction. He's not even a member. And never has been a member. Matt Comer broke the story after one of his associates contacted the ACPM to inquire about Forrester's claim. The quick answer to your questions is that Dr. Forrester is not, and never has been, a member of ACPM (much less a Fellow, which is our highest designation of membership) .... However, this is troubling to us, too, that he’s apparently claiming to be a Fellow of ACPM, and we would like to know where Dr. Forrester is making these proclamations so that we can approach him and demand that he cease falsely using ACPM credentials in his campaign or wherever else he’s using it. If you can point us to some places where he’s using those credentials, we’d be most appreciative. At a Gaston County townhall meeting on Sept. 8th, Forrester made certain certifiably false medical claims about the life expectancy of gay people, which were dutifully reported in the Gaston Gazette without challenge or verification. Those claims made by Forrester have subsequently been refuted, though Forrester refuses to answer questions about where he got his "facts." Possibly the same place he got his "fellow" status with the American College of Preventative Medicine. Forrester also asserted at the Gaston County townhall that Asheville is "a cesspool of sin" because its gay-friendly. Mr. (Dr.) Forrester knows cesspools, since he evidently lives neck-deep in one. J.W., thanks for posting and helping to spread the word. Just wanted to add that it was blogger Scott Rose at Pam's House Blend who actually "broke" the story, though QNotes was the first print news organization to write on it. WRAL picked up the story tonight. One LGBT print paper with a story online. One MSM TV station. Maybe MSM print news tomorrow? We hope. That toad was at one time the deputy adjutant general of the Air Guard in NC. What a disappoint that he should represent NC in the general assembly...crank phones in the age of smart phones...he's gotta go. He was a member until his membership expired. This was confirmed by ACPM officials. Perhaps he should have been clear on his website that he was no longer a member but the efforts of you and the other lefty-loonies to turn this into a huge scandal is just an act of desperation. Maybe he should have pulled a Perdue and said that he was only kidding? Well, evidently he was a member of the ACPM in 1984. I get that that's not as bad as fabricating the credential outright, but that's going on 30 years ago. It's hard to believe he didn't know that you don't list a credential you haven't held in over 25 years. And when he's making patently false medical assertions about homosexuality, it does call into question his medical knowledge and his credentials, so I think it's a valid issue to raise. Not Really, how do you know his comments on homosexuality are false? Is this because of conflicting medical opinions (which would not mean they were false), your opinion (which would not mean they were false), or your personal experience (which would only make them true as they pertain to you)? These are valid questions also. His claim about homosexuals' lifespan being 20 yrs. shorter than that of heterosexuals is based on a 1994 study that has actually become a *textbook study* of poorly done research. Not to mention that in 1994, HIV/AIDS was more prevalent in the gay community and mortality rates from AIDS were higher, and HIV/AIDS rates were always cited as an explanation for any difference in life expectancy. So if there was some real effect then it may not apply today at all. Then again, maybe it shouldn't come as a surprise that a man touting credentials from 1984 is also stuck in the early 90s when it comes to medical research.